The philosophy of Mahima Dharma, a religious tradition of Odisha, is centred around the concept of God as Shunya-Brahman, and is remarkable for its stance towards religion, man and society. Mahima Dharma, though very much a part of the Indian religio-philosophical tradition, boldly defies idolatry, meaningless rites, religious pomposites and social discrimination, based on varna dharmajati. Bhima Bhoi, the chief protagonist of this dharma, presents a shunya-centric metaphysics and takes it to a meaningful logical conclusion. Bhima Bhoi, a well-known tribal poet of nineteenth-century Odisha, presents through his lyrical compositions rarefied concepts like Shunya-Brahman, identity between jiva and Brahman, the relation between brahmanda and pinda and bhakti as atmajnana. His words, choice of philosophical ideas and style of presentation bear the stamp of his predecessors, Pancasakha and Caitanya Dasa. 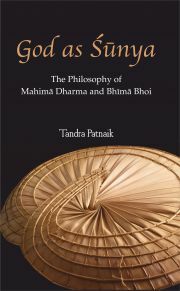 This volume concisely deals with the varied aspects of Indian religio-philosophic tradition such as God as shunya in other traditions, the genesis of Mahima Dharma and its approach and interpretation of Shunya-Brahman, the relationship between God and man, and the dissident stream of spirituality. It talks about the persona of Bhima Bhoi as a poet and a philosopher, and his contested status in the society; also the impact of other thought systems like Buddhism, classical Advaitism, Sanatana Dharma on Mahima Dharma. Academic in nature, this book should propel the inquisitiveness of many a researcher on Indian religio-philosophic systems and students of philosophy and theological systems. Bibliographic Information: 1st Edition. 190 Pages.